Vineyard/Varietal: 80h vineyard, with 50h in Saint-Emilion! Planted to Merlot 85%, Cabernet Franc 10%, and Cabernet Sauvignon 5% (and a small parcel of white). Winegrower/Consultant: Alain Dourthe / Michel Rolland. Located on the eastern slopes of Saint-Emilion, these south-facing parcels form a crescent around a rocky knoll which is topped with a charming 18th C. chartreuse. In 1987 the Guisez family inherited the 40h property and brought it back to life. Corinne Guisez sold the estate in 2005 to Silvio Denz – a Swiss businessman, who has since doubled the size of the vineyard. Wine-growing is managed by Alain Dourthe – he and his team have been together since 1997 – this is the strength of Faugeres. The vines are densely-planted (8800 per h), see no pesticides, and only small amounts of copper and sulphur are used to fight mildew. The vineyard team has planted two miles of hedgerows – unique in all of Bordeaux. This biodiversity, coupled with a second state-of-the-art winemaking cathedral, designed by Mario Botta, has led to better selection and fermentation, a new second wine, and wines with more intensity and power, finesse and longevity. Chateau Faugeres Bordeaux Blanc, 2014…..A sensational blend of Sauvignon Blanc and Gris, with Semillon – this is the second release and the first to reach the US. Only one hectare, planted in 2006 on the limestone plateau across from Fleur Cardinale and Valandrau – its citrus/apple/pear notes are thirst-quenching. Chateau Cap de Faugeres, 2012….. Made with the same care and attention to detail as the Saint–Emilion and at half the price – gorgeous black fruit and lush tannins. Considered a sleeper of the vintage. 85% Merlot and the balance Cabernet Sauvignon and Franc. 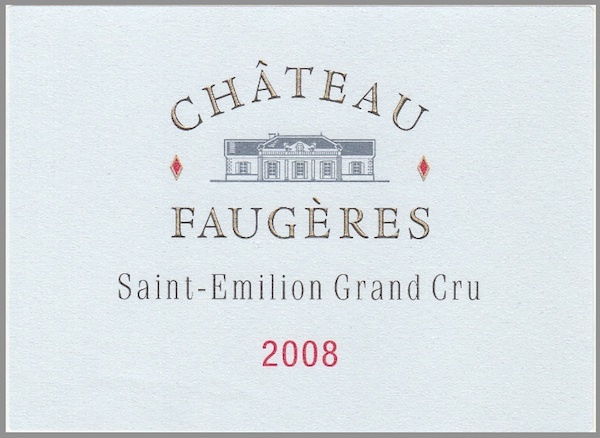 Haut-Faugeres Saint-Emilion Grand Cru, 2012…..The second wine of the estate – ripe and ready with bright blueberry bouquet, full-bodied, velvet tannins, and crisp acidity. Chateau Faugeres Grand Cru Classé, 2012…..Very low-yields (18hl/h), 85% Merlot, 10% Cabernet Franc, and 5% Cabernet Sauvignon – dense, yet silky and pure. Rich and mature with superb graininess and mature, silky tannins. Hand-harvested over three weeks in October at only 30hl/h. Dense purple color, blackberry nose, and it finishes with intoxicating smoky, crushed rose-petal undertones. Le Merle de Peby Faugeres, 2011 …..First release of the second wine of Peby. Pure undiluted Merlot from younger vines, yet mature beyond its years. Chateau Peby Faugeres, 2011…..A wine with incredible texture and length, this Merlot comes from the oldest and steepest vineyard plots, and aims to rival the best of the Right Bank. Massive and inky, and with tiny 18hl/h yields, it is a dense, powerful wine – and the bracing acidity keeps the ripe tannins in check. A wine for the ages, succulent now and built to last.